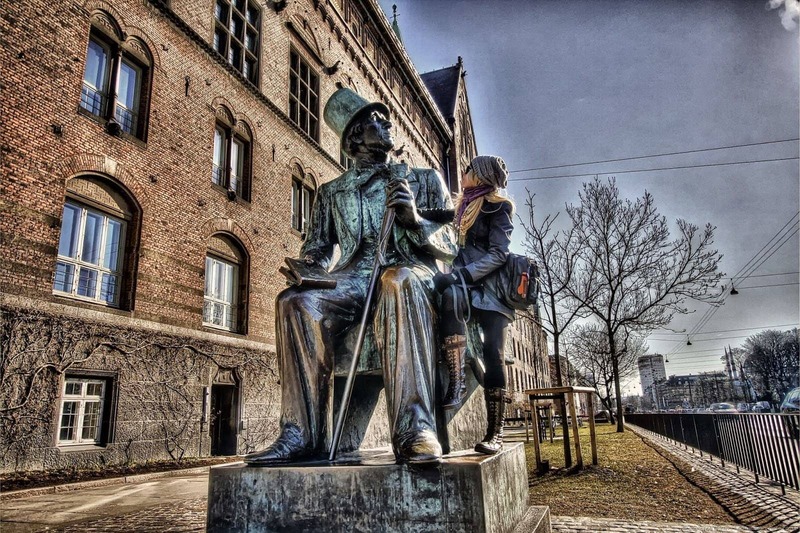 There are definitely more comfortable places to sit than on Hans Christian Andersen’s left knee. On top of that, instead of telling me a story out of the book that is resting on his right knee, he is staring over to the Tivoli, the famous theme park, completely ignoring me. Well, I can’t say that’s good manners but I do understand why he is like that. Who even knows how many people sit on his lap on a daily basis to have their picture taken. Apart from that, it’s a really nice sunny day in Copenhagen, with the first flowers announcing that spring might finally have arrived after this long cold winter. So maybe Hans is just day-dreaming. I, on the other hand, ain’t got time for that! I arrived here in Denmark’s capital yesterday and I have only today to see the city. Luckily it’s very walkable. Hey, why don’t you guys tag along? Yes? Cool! But I’m warning you: I’m a fast walker… Alright, let’s go! 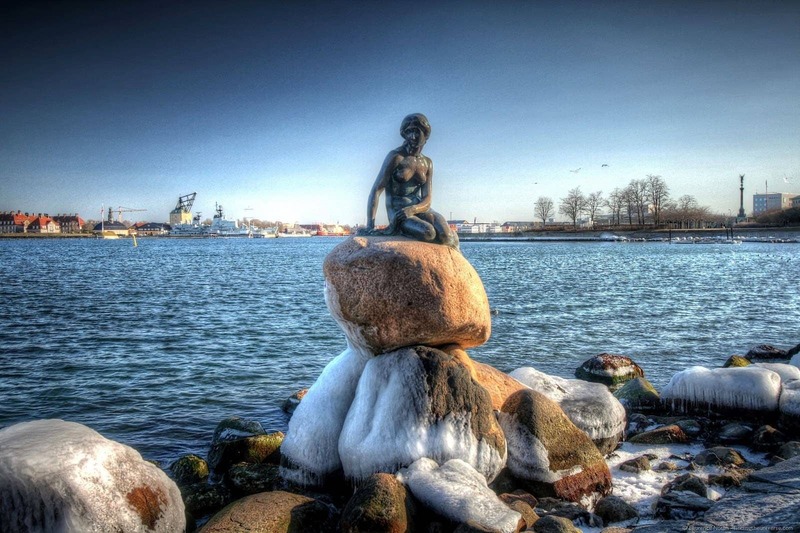 Okay, so we’ve seen the statue of Hans Christian Andersen, the Danish author who is mainly famous for his fairy tales, like “The little mermaid”, “Thumbelina” or “The emperor’s new clothes”, for instance. The building next to him? That’s the City Hall. It has even got a bell tower you can climb. I like the little dragons in front of it best, though – and the Dragon Fountain on the Town Hall Square! Dragons are a good way of starting a city tour, don’t you think? So now we’ll walk along H.C. Andersen Boulevard, with the Tivoli on our right, until we get to the Glyptotek, which is also on the right. Now, this is a bit of a pickle. I have heard really great things about this gallery. 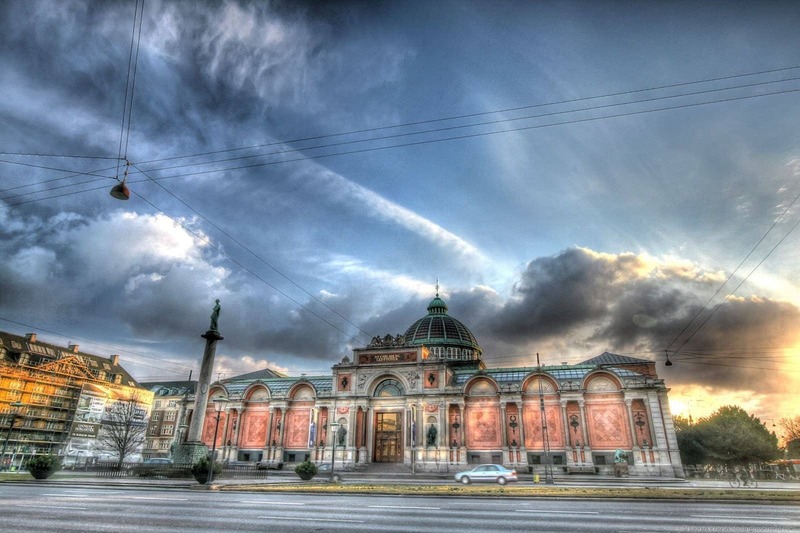 Not only because it houses a broad art collection and many works of famous European masters, but also because the building itself is quite special. There is for example a huge winter garden with palm trees in the centre of it. But I don’t think I have enough time to visit it today. So let’s move onwards – we head towards the city centre now. Past the National Gallery to Christiansborg Palace. No, the Royal family doesn’t live here; this is the seat of the House of Parliament and the Supreme Court. Okay, so the king USED to live here, but the palace burnt down in 1794 and they had to move – but the Royal stables are still here! Am I going too fast? If you want to, you can stay and go inside – the grounds have quite a history! No? Right, then let’s walk over Christiansbridge to Christianshavn. Look at the canals and the houses – reminds me a bit of Amsterdam. And do you see that twirly church tower over there? It belongs to the “Church of Our Saviour”, our next destination. You’re not scared of heights, are you? Because we are totally going up that tower! Wow, good view! Oh look ,over there, that’s Christiana. I’m sure you’ve heard of it. 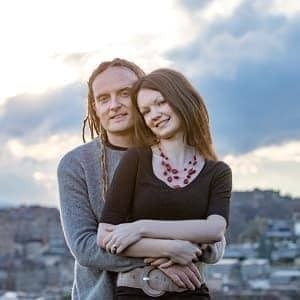 In the 1970s a bunch of university students, hippies and artists occupied this former army base and finally declared it autonomous. They have their own supervision and don’t allow cars in their freetown, as they call it. It’s a big tourist attraction. It’s another place I really want to see, but would like to take my time – and time is scarce today, so I’ll save it for my next trip. Now we’ll go back over Christiansbridge and take a right turn, walking along the waterfront. Aren’t we lucky with the weather? What a great day! 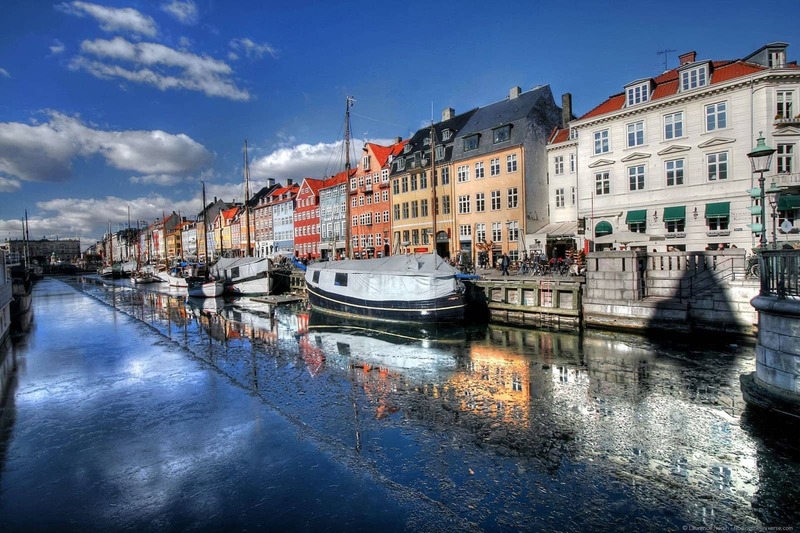 Let’s go to “Nyhavn”, which means “New harbour”. It’s rather old, in fact, but very nicely done up. Can you imagine that this used to be a pretty disreputable area? Indeed, it’s the place where all the sailors came once their ship had docked in Copenhagen, looking for wine, women and song. What exactly Hans Christian Andersen was looking for, we shall never know, but he liked this place well enough to live here. Nowadays the house front is beautifully restored and shines its colours at the spectators. By the way, I’m getting a bit nibbly, what about you guys? The restaurants here at Nyhavn have a good reputation, but also a steep price… Wait a sec, do you see that place on the corner over there? They have a lunch special and you can even sit outside. Perfect. Mmh, that was yum. Could you hand me the map, please? Let’s see… Here, if we walk up this street, “Bregaden”, we’ll automatically get to the Marble Church. 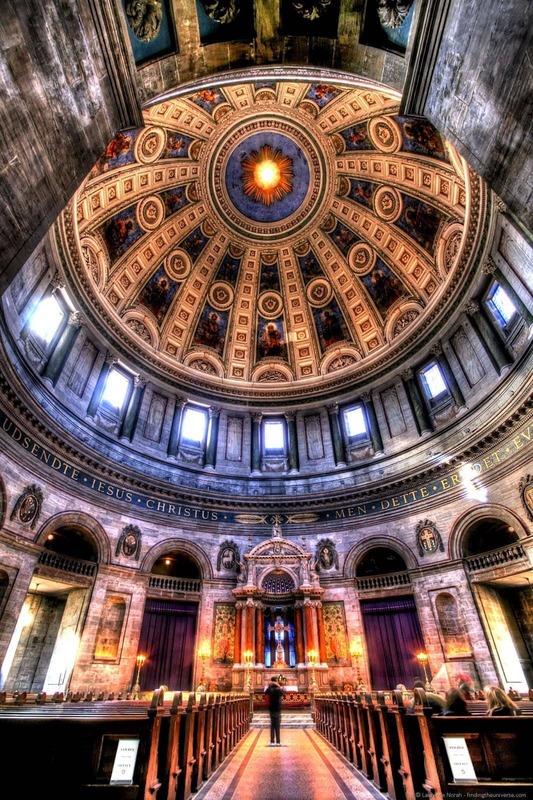 Impressive cupola, right? And despite the name, it’s not all marble – there were some financial issues. Turned out that the Norwegian marble they started building it with was quite expensive, so a good part of it is Danish sandstone. 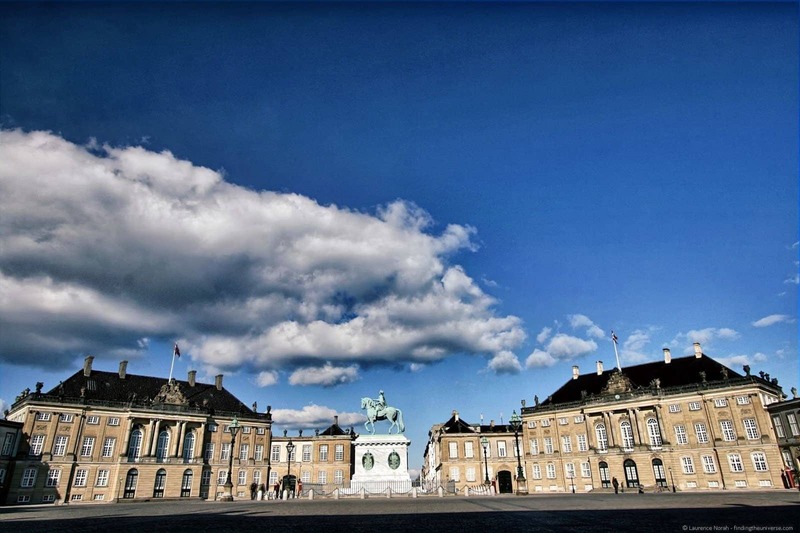 Let’s head over to the waterfront again, because Amalienborg Castle is right on the way. Look at the Royal guards, walking up and down. Oh no, I completely forgot: at 12 ‘o’ clock you can see the change of guards… Well, I guess we missed that. You could come back tomorrow to see it, if you want to. As long as the queen is in residence, they’ll do the change of guards at noon. Just check if the flags on the buildings are up – this indicates the queen’s presence. Yeah, I know: it doesn’t really look like a Royal Castle, does it. It wasn’t meant to be one, either. The King ordered four nobles to built four identical palaces around the equestrian statue in the middle of the square. When the former Royal Palace burnt down – that was Christiansborg Palace, oh yes, I did very much tell you that! Where the parliament is! Really…- the King moved in here, and since then, it has been the Royal residence. Right, on we go. We’ll walk along the waterfront again. Can you guess what’s next? Exactly: the little mermaid! I’m quite excited. Let’s go through Churchill park – see this massive monument here? That’s the Gefion fountain, which shows the Norse goddess Gefjun ploughing the earth with two oxen. Next to it is Denmark’s only Anglican church, St. Alban. Sure looks British, doesn’t it! 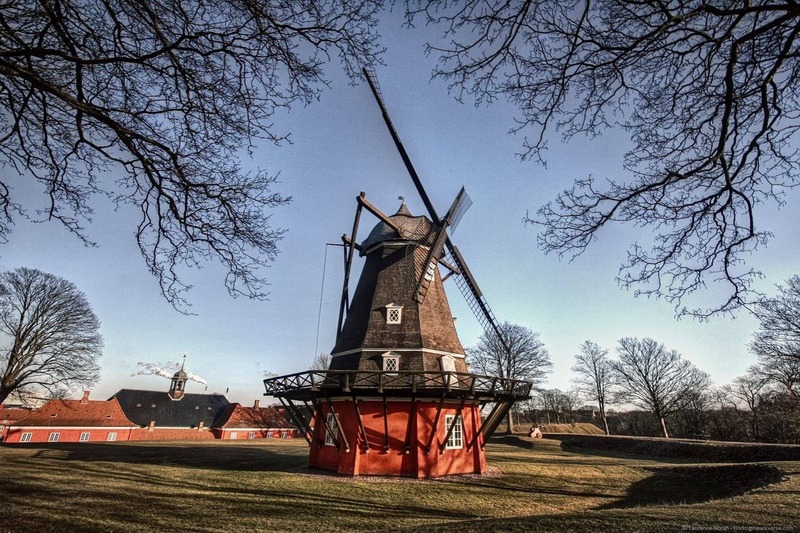 There are a number of sculptures in this park, but where now is Copenhagen’s landmark? Must be over there, where the cluster of people is standing… There she is, we have found her: the little mermaid! Now that’s funny: so many people have said that they were disappointed by her size because they expected her to be bigger that I actually find her much bigger than I thought she would be. Wait, just one more picture…! Alright, where to now? Oh, the park over there? That’s actually not a park, but Kastellet, a military defence, built in the 17th century. It’s a star fortress – looks like a pentagram from above. Come on, let’s check it out! Going through the gate, it doesn’t feel too military, does it? It looks more like a neat little village although it’s actually the seat of the Danish Defence ministry. But the whole thing is also a public park and a historic site, so we can walk around, no problem. Look, there’s even a little wind-mill! Uhm, looking at my watch I think we should probably head back, though. 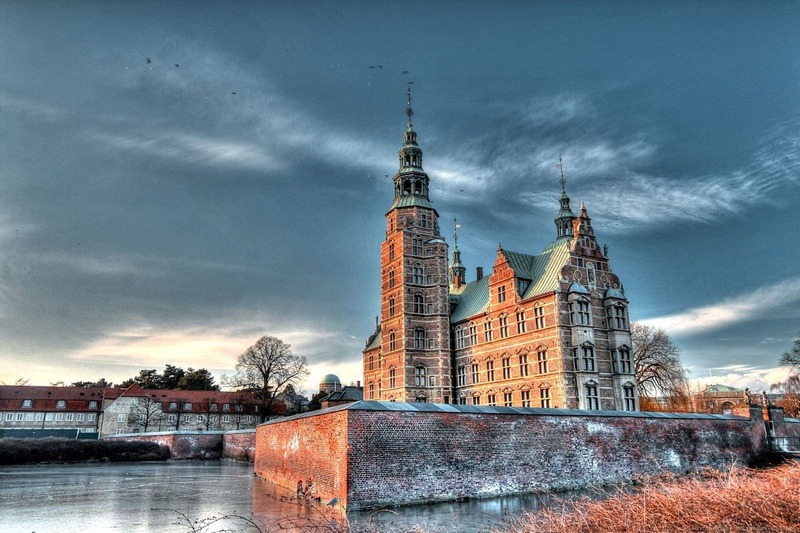 We can walk past the Rosenborg Castle – it’s where the crown jewels live and many more Royal things you can look at. On the other side of it are the Botanical gardens. More parks than you can shake a stick at, definitely. Although the park surrounding the Rosenborg Castle is actually called King’s Garden. Let’s check the map: so, if we walk down this street called “Landemaerket”, we should come to the Round Tower. This is the oldest functioning observatory in Europe! And that’s not all: you can walk all the way up to an outdoor platform, but not via stairs. They built a spiral walk inside that would allow a horse with a carriage to deliver books and other goods to the top – quite extraordinary, right? We’re pretty much done, folks. Not that Copenhagen doesn’t have more to offer, but I think we covered a good bit of the most important sights. If we follow this road, we’ll pass St. Peter’s Church, and if we turn left there, we can have a look at the Copenhagen Cathedral. Can’t go wrong with churches when sight-seeing. Hey, should we go back to the City Hall via the Stroget? That’s a shopping district, pedestrianized and everything. They’ve got quite some unique stuff here, from budget to luxury. How would you like a bit of window-shopping? What, you would rather have a beer? Well sure, why not. You should have told me, than we could have gone to the Carlsberg Brewery – they do tours, beer included! Man, I gotta say, you did really well, keeping up with me like that – it was a good day, wasn’t it? Tell you what: the first round is on me. How do you say “Cheers” in Danish again? Pardon? Right! 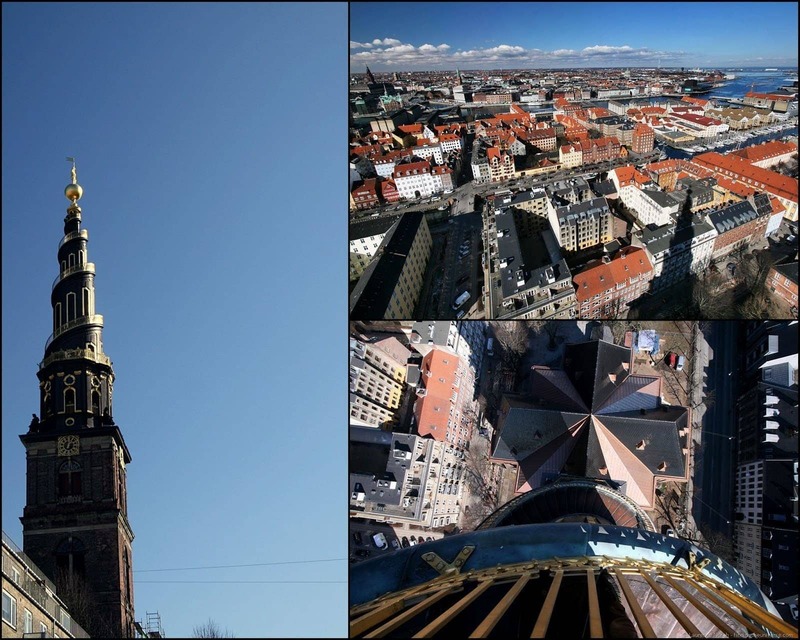 So: to us and the many sights of Copenhagen – Skal! During our time in Copenhagen we stayed at the Absalon Hotel (full review here) thanks to our accommodation partners on our trip: HostelBookers.com. Thanks guys!